This mass shooting in California happened 11 days after the one at a synagogue in Pittsburgh. And in the time between those two incidents, there were several other mass shootings that barely made headlines. As heartbreaking as these tragedies are, psychologists say that when they happen so often, we may become numb to their impact. NPR's Rhitu Chatterjee reports. GINGER ELLENBECKER: My immediate reaction was, another one - here's another one. ELLENBECKER: I'm not very surprised when it does happen anymore. CHATTERJEE: A lot of other people feel the same way. Roger Chui is a software developer in Lexington, Ky.
ROGER CHUI: Hear about it on the news and you're like - oh, well, happened again, I guess. Looking back on it, it's kind of sad that that's kind of how desensitized we are now. 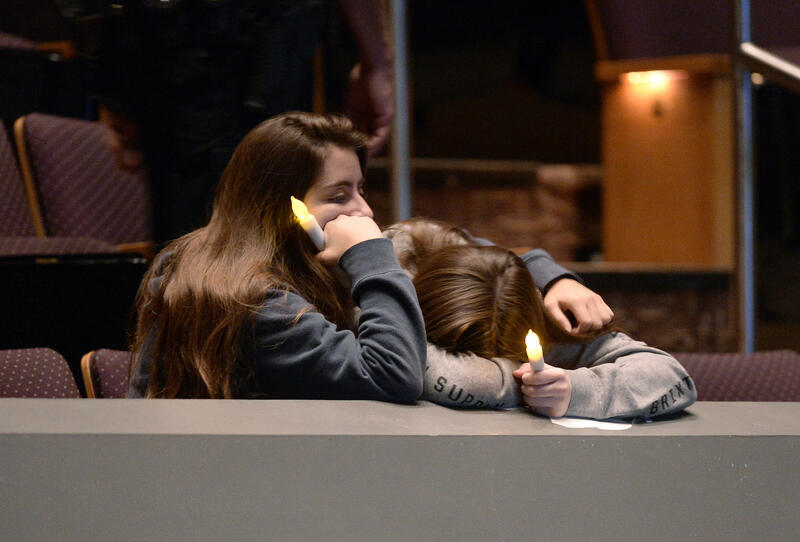 CHATTERJEE: It turns out that desensitization, the numbing of emotions when we've seen or heard of one shooting after another - that's a natural response. Charles Figley, a psychologist at Tulane University, says there's even a term for it - compassion fatigue. CHARLES FIGLEY: Compassion fatigue is the fatigue of providing compassion and empathy. CHATTERJEE: He says thinking too much about traumatic events can make people too anxious or depressed to function in their daily lives. That can happen when people see suffering across the world or, in the case of these shootings, closer to home. FIGLEY: We, of course, think about ourselves being in such a place in which someone would suddenly burst in and shoot things up. But if we think about that too much, then it deteriorates our sense of confidence and our sense of trust and our sense of safety. CHATTERJEE: Figley and other researchers have seen this in professionals who work in human services - doctors, nurses, social workers, people who deal every day with the struggles and tragedies of other people, he says, initially, people in these professions have what's called secondary trauma. FIGLEY: Over time, there is a buildup of this kind or secondary trauma or vicarious trauma that leads to compassion fatigue or dysfunction, if you will. CHATTERJEE: He says, in the long run, it helps protect us by allowing us to stay present and emotionally engaged with our family and friends. Another reason why people might find themselves feeling numb after a while is because the emotional circuitry in our brains is bad with numbers. PAUL SLOVIC: It's a very sophisticated system, the feeling system. But it's innumerate. The feeling system can't add, and it can't multiply. CHATTERJEE: Paul Slovic is a psychologist at the University of Oregon. And he studied whether and how human beings respond to big humanitarian tragedies, like famine or genocide or war. He says people care most when they hear about a single individual - say, one victim of a mass shooting or the drowned Syrian boy whose body washed up on a beach in Turkey. SLOVIC: Especially if they're identified and you see their face and their name, something about them - gets the strongest response. CHATTERJEE: For 16-year-old Audrey Cho of Grosse Pointe Woods, Mich., news of mass shootings, especially school shootings, really worry her. AUDREY CHO: It's hard not to think - well, this could happen to me. CHATTERJEE: But she consciously tries to not let it overwhelm her. CHO: This is something very serious. But you can't allow this to be so detrimental that, like, you never leave your house or something like that because that's impossible. CHATTERJEE: Rhitu Chatterjee, NPR News. (SOUNDBITE OF TYCHO'S "MELANINE") Transcript provided by NPR, Copyright NPR.